The Food Doctor Ultimate Diet : Changing the Way You Eat for Good! The most comprehensive advice yet to help you eat well and lose weight for good from bestselling Food Doctor, Ian Marber. "All you need to be healthy for life" - Heat, on The Food Doctor Diet Club. Change the way you eat, blitz bad habits and lose weight for good with this guide to the best of The Food Doctor. Start with a seven-day diet programme (no calorie-counting) to kick-start your weight loss, then pick up new habits for life with 10 simple Food Doctor healthy eating principles and an easy-to-follow 30 day plan. Motivational case studies prove this plan really works. Packed with loads of delicious recipes, and flexible menu options - from lunch on the run to car journey snacks and family meals - this is the last diet book you'll ever need to read! Achieve real weight loss fast and change the way you eat for good. "I find I'm no longer leaving back-to-back meetings exhausted and starving." - Jo Wiley, Radio 1 DJ. 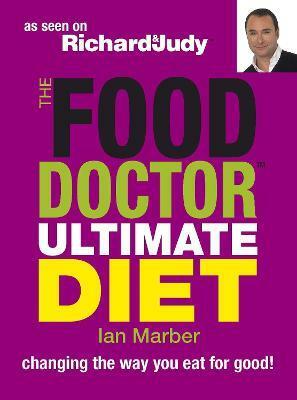 Ian Marber Dip ION is the UK's leading nutritionist and founder of The Food Doctor brand. Ian is a regular contributor to The Sunday Times and has regularly appeared on Richard and Judy and GMTV. Ian's large range of foods is available at health food shops and supermarkets nationwide. He lives in London.